Stocks fell slightly Thursday but the Dow, S&P 500 and Nasdaq remain near their all-time highs. So it might just be a mild hangover following the Federal Reserve's decision to start selling some of the $4.5 trillion in assets it bought during the past few years. The Fed announced on Wednesday it would begin unwinding its investment portfolio in October, a move that was telegraphed to the market for a while. Fed chair Janet Yellen also didn't rule out the possibility of another interest rate hike in December. But while Wall Street has often viewed rate increases as something to fear, investors aren't sweating the possibility of another boost. That's because rates remain near historically low levels. Any increase is a sign of confidence in the economy by the Fed. Investors seem to get that. 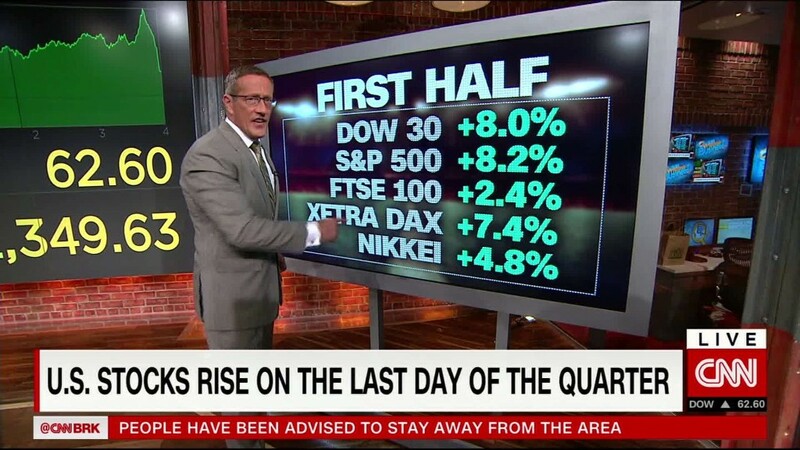 The Dow & S&P 500 have both gained more than 10% this year while the Nasdaq is up nearly 20%. That's in spite of the fact there are still concerns about what President Donald Trump and Congress will be able to do to help stimulate the economy. Simply put, Wall Street thinks that consumers will still spend and corporations will keep hiring even if they don't get help from Washington. And nobody is too worried about the possibility of Yellen -- or her potential future successor once her term as Fed chair ends next February -- nipping the recovery in the bud by jacking up interest rates too aggressively. The economy may be in that proverbial Goldilocks spot. It's not growing at too hot a pace to stoke fears of rapid inflation. But it's not so cold that it's causing consumers and businesses to pull back either. "Future rate hikes will be so slow that investors can prepare for them," said Chris Gaffney, president of EverBank World Markets. "People are okay with gradual tightening. It's good for companies and consumers are more confident." Gaffney admitted that there are some concerns about the fact that the market still doesn't know who will be leading the Fed a year from now. "The Fed could be more hawkish next year. And deep down, Yellen is still a dove," Gaffney said, referring to Wall Street's bird metaphors for central bankers. A hawk is someone more likely to raise interest rates while a dove would prefer to keep them low. Yellen has repeatedly said she will serve out her term as Fed chair but has refused to answer questions about whether she'd agree to stick around for a second term if President Trump asked her to stay. Jack Flaherty, an investment director at GAM, thinks the market wouldn't bat an eye if Trump reappointed Yellen. "The job market continues to do well. The unemployment rate should keep going down," he said. "If inflation remains low and people keep getting hired, why would anyone be unhappy with Yellen?" Still, the big question that remains is whether or not the Fed should be boosting rates more aggressively. There is a debate about whether the Fed is being too dismissive of the inflation threat. Chris Bertelsen, chief investment officer with Aviance Capital Management, says the Fed needs to raise rates more dramatically. He argues that they should not be still near their 2008 and 2009 crisis era lows given the improvement in the stock market and economy. That's why he thinks people should be prepared for more rate hikes and should consider buying more conservative investments like Verizon (VZ), which pays a dividend that yields nearly 5%, and the First Trust Tactical High Yield (HYLS) bond ETF. Both have lagged the market this year. Verizon's stock is down about 8% while the high yield bond ETF is up just 1.5%. But Flaherty isn't too concerned about the Fed being asleep at the wheel. It's not as if inflation is a threat that's being ignored. "The Fed, like everybody else, is looking for signs of inflation. Is there a chance that the Fed is behind the curve? So far, they haven't been," Flaherty said.